Today's renewable energy solutions rely on batteries. 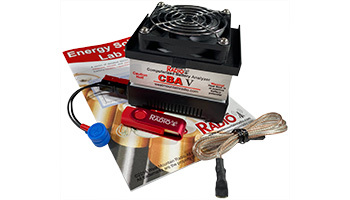 The Energy Science Lab Kit is an educational series of detailed electrical experiments to precisely measure, record, and compare performance of various battery models, capacities, and chemistries. Teachers are able to show students real-world battery performance investigations that are interesting and relevant to all students relying on portable electronic devices as part of their daily lives! Exercises show how to measure battery effectiveness and identify the limitations. Brand Name vs. No Name - Test AA off-the-shelf batteries to determine which is the best value. Typical - I'm Not Typical - Explore how different discharge profiles affect Ampere-Hours capacity. Older, But Not Better - Determine the affects of aging on batteries. Size Really Matters - The real energy difference between AAA, AA, C, & D cells. Burr - I'm Cold - The affects of temperature variance on batteries. Cost vs. Value - Analyze new specialty AA cells versus the higher cost. Instructor version includes all necessary tables, test results, observations and conclusions. Student version has clear objectives and step-by-step instructions to perform each experiment. Inquiry version consists of two-page limited (open-ended) directions for advanced students. Dimensions: 3.5" H x 2.8" W x 3.6" D.